Crash test ratings have just been released for the Chevy Volt and Nissan Leaf, both of which scored incredibly well. Image from Wikimedia Commons. Recent crash tests performed on the Chevrolet Volt and the Nissan Leaf went well. Both cars, the newest entrants in green car offerings from major car makers, tested very well in the Insurance Institute for Highway Safety crash tests. Neither car has been tested by the American government yet. The Insurance Institute for Highway Safety has given its seal of approval to two more “green cars,” as the Chevy Volt and the Nissan Leaf have performed very well in crash testing, according to CNN. Not only were both cars impressive, but they actually earned the Top Safety Pick award from the IIHS, a prestigious award for automotive safety. The electric systems in the cars were not affected by the impacts, as both have safety features which shut off power in the event of a crash. The batteries in both cars were also well-shielded in case of a crash. Testing standards in crash tests are different for the IIHS and the National Highway Traffic Safety Administration. 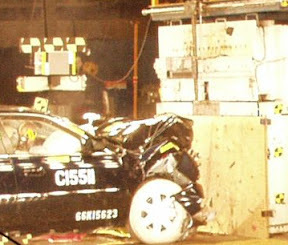 The IIHS does not test crash-worthiness by crashing cars together, but rather by slamming cars into stationary objects. The Leaf and Volt also scored very well in guarding against whiplash in the event of a crash. The NHTSA hasn’t tested either model yet, though the other green cars tested by the NHTSA have scored fairly well, according to the NHTSA site SaferCars.gov. For instance, the Ford Fusion Hybrid scored four out of five stars and the Toyota Prius scored five out of five in the new five star rating system that the NHTSA implemented for 2011. Green cars with large amounts of batteries on board weigh more than their gas engine counterparts. The Leaf weighs nearly 3,400 pounds and the Volt weighs nearly 3,800 pounds, according to MSNBC, which gives both cars an advantage. The heavier object in a collision receives the least of the damage, so green cars loaded to the gills with batteries may be safe for the family and also for the wallet at the pump. However, small city cars like the Smart ForTwo do not test well in crash tests, though they aren’t required to as tiny cars meant solely for urban driving do not have to be subjected to NHTSA standards.